A very peculiar fish that lives off the southeastern coast of Australia and Tasmania has been given an unusual honor: being christened the world’s ugliest endangered animal. 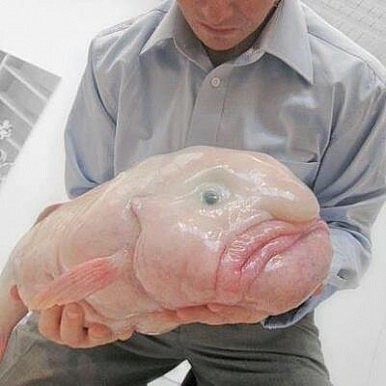 Meet the blobfish, the official mascot of the Ugly Animal Preservation Society, a comedy troupe organized by British comic Paul Foot. The blobfish doesn’t have any trouble next to the beloved panda. Bald, up to 12-inches long, sometimes drooling, gelatinous, and expressing what may best be described as a scowl – or perhaps a frown – the elusive dweller of the Pacific was given a boost in the race to be considered the least unattractive endangered animal by Foot, whose YouTube campaign on behalf of the aquatic contestant can be seen here. Fans of The Hitchhiker’s Guide to the Galaxy may see a resemblance to a Vogon. If nothing else, the blobfish must be respected for its ability to survive adversity. According to Simon Watt, the biologist and journalist who arranged the vote, the survivor can be found swimming as deep as 2,000 to 4,000 feet. Foot adds that its Jell-O-like skin allows it to more or less hover along with the current, without lifting a fin. For food, it simply opens its mouth and lets unsuspecting deep-sea crustaceans and other particles drift in. As it floats along, the blobfish is prone to ending up in deep-sea fishing nets, which is the primary threat to its survival. Its (lack of) hard work was recognized by Foot who teamed up with the British National Science and Engineering Competition to stream the comedy troupe’s show on the internet. The group’s 11 comedians proceed to make a case for their chosen “aesthetically challenged” animal. Viewers then vote by hitting the “like” button under the videos they enjoyed most. Other entrants included the kakapo (a flightless “owl-like parrot” native to New Zealand), flightless dung beetle, pig-nosed turtle, axolotl (a Mexican amphibian known as the “walking fish” – a salamander that remains in its larval state and can regrow limbs), the proboscis monkey (with its obscenely large schnozzle), and Titicaca water frog (aka, “scrotum frog”). Of the 88,000 viewers who voted, the blobfish trumped its competition.